Banana pudding is a nostalgic dessert and this summer version adds ice cream to the bowl. While no actual pudding is in this dessert, it still echoes known and loved flavors in the old standby. Fresh banana slices are sauteed in sugar and butter before they poured over vanilla ice cream and served with vanilla wafer cookies. This warm weather treat would also be delicious with a drizzle of salted caramel sauce. Click here to see the other recipes using Breyers vanilla ice cream. Step 1: On a baking sheet, sprinkle the turbinado sugar on the flat side of the 4 banana slices. Step 2: Sauté bananas in a small 6-inch nonstick pan with the unsalted butter. Step 1: Place 1/2 cup Breyers Natural Vanilla Ice Cream into a small wide rimmed glass, then wedge 2 cookies on either side and top with sautéed bananas. Editorial Disclosure: Foodista was not paid for this post. 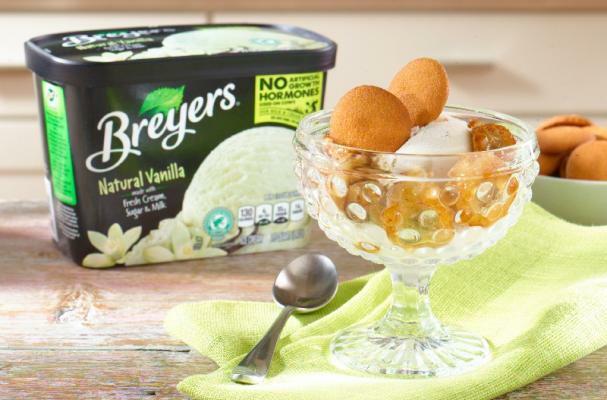 According to a company press release, Breyers will only source milk and cream from farmers who do not treat their cows with artificial growth hormones and obtain 100 percent of its vanilla from Rainforest Alliance Certified and sustainably farmed sources across all of its offerings.